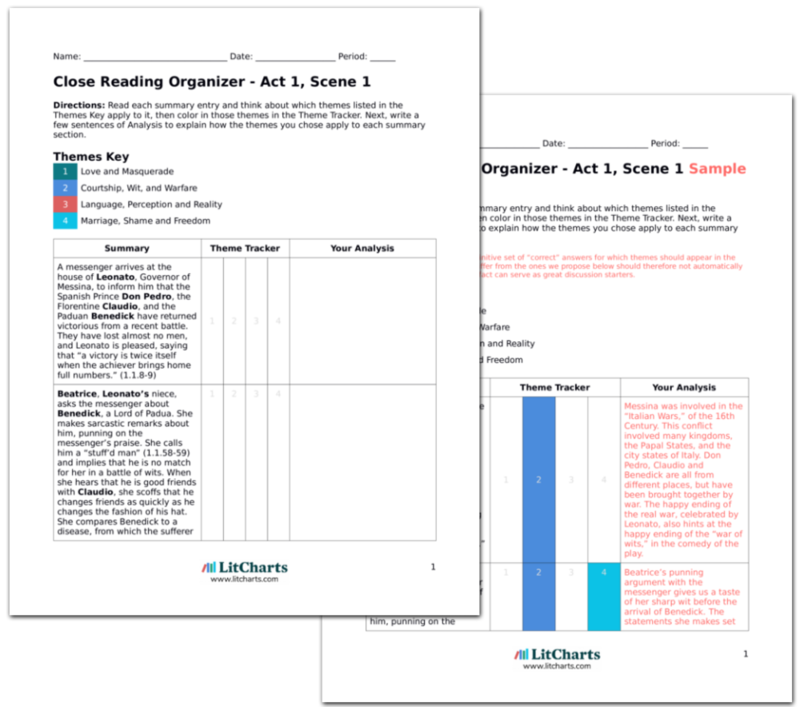 LitCharts assigns a color and icon to each theme in Much Ado About Nothing, which you can use to track the themes throughout the work. Alone in Leonato’s garden, Benedick complains that Claudio, who he had considered a bachelor and a military man at heart, has become a lover and is planning to be married. He contrasts the accessories of war with the accessories of love: Claudio has traded the “drum and fife,” of war for the “tabor and pipe,” (2.3.13-15) of romance. Benedick wonders if he will ever change his mind about love and marriage, and concludes that it is more likely that he will turn into an oyster. Listing every good quality that a woman might possess, he decides that he could never be with any woman who did not possess all of them. Benedick’s annoyance with Claudio’s engagement suggests that he might be feeling the pressure to do the same—just as Hero’s engagement seemed to briefly change Beatrice’s mind about marriage. With his talk of instruments, Benedick continues the comparison and contrast between war and courtship in the play. Oysters were considered aphrodisiacs and symbols of love. Like Beatrice in the first scene of this act, Benedick avoids the idea of marriage by constructing an impossible partner—the perfect woman—as the only person he could be with. Don Pedro, Leonato, Claudio and Balthazar enter the garden. Benedick hides behind some trees, and though they see him they pretend not to notice him. At Don Pedro’s urging, Balthazar plays some music. Before beginning to play, Balthazar says: “Note this before my notes; There’s not a note of mine that’s worth the noting.” (2.3.55) Benedick, listening from his hiding place, finds the music beautiful but wonders if Balthazar’s terrible voice might be an evil omen. Don Pedro sends Balthasar away, asking him to make sure there is music for “the Lady Hero’s chamber-window,” (2.3.86-87) the next night. Balthazar’s punning on noting and nothing gets at the heart of the play and its title. 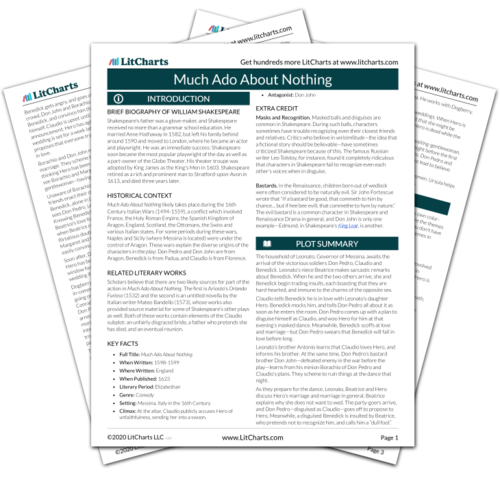 Much ado (a lot of fuss) is made because characters keep noting (noticing, believing) nothings (lies and tricks based on hearsay). Balthazar’s bad singing suggests to Benedick that there is something “off,” about the whole meeting that follows; which, of course, there is. Don Pedro’s innocent mention of Lady Hero’s chamber-window is meant to be ominous for the audience, which knows about Don John’s trick. 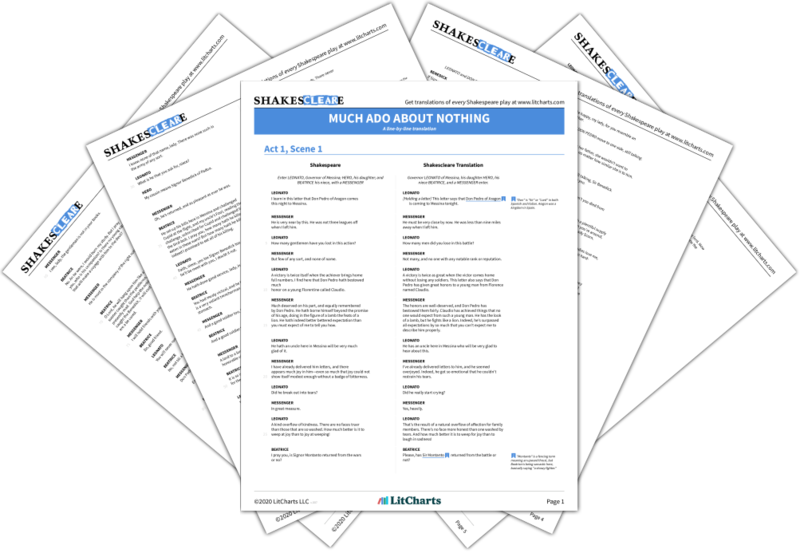 Characters in Much Ado About Nothing trust and are influenced by what they overhear more than what they are directly told. Though Claudio and Don Pedro have told Benedick to give love a chance before, it is only when he overhears them that this changes anything. To make it seem plausible that Beatrice loves Benedick, Don Pedro, Leonato and Claudio come up with explanations for her bad attitude—she does it to hide her love. And, in a play full of people falling for other people's lies, Benedick believes the lie that Beatrice's hate for him is itself a lie. Beatrice comes to invite Benedick in for dinner. Uncharacteristically, he treats her with gallantry and friendliness. Thinking he is simply afraid to banter with her as usual, Beatrice accuses him of having “no stomach,” (2.3.256) and departs. Despite her rudeness, Benedick interprets everything she has said as having double meanings that betray her love for him. What he has overheard has such an influence on his perception of reality that Benedick believes Beatrice loves him—and this in spite of the clear evidence to the contrary which is right before his eyes. Once again, language—not sight—is the determining factor in a character’s perception of reality. Lucas, Julian. "Much Ado About Nothing Act 2, Scene 3." LitCharts. LitCharts LLC, 16 Sep 2013. Web. 26 Feb 2019. Lucas, Julian. "Much Ado About Nothing Act 2, Scene 3." LitCharts LLC, September 16, 2013. 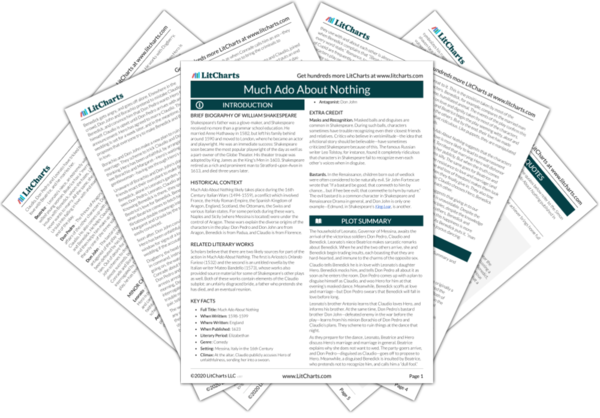 Retrieved February 26, 2019. https://www.litcharts.com/lit/much-ado-about-nothing/act-2-scene-3.